Finally, the Islamic Law of Sacred Space makes clear that when Muslims build mosques they are claiming ground for Islam. 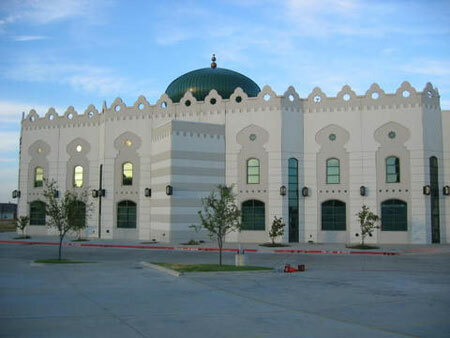 Specifically, a radius of up to three (3) miles from the mosque belongs to Islam. This explains why the Muslim Brotherhood, with funding from Saudi Arabia and others, are building huge mosques in the middle of nowhere in America. They are claiming ground for Islam. Now all they have to do is occupy that ground. 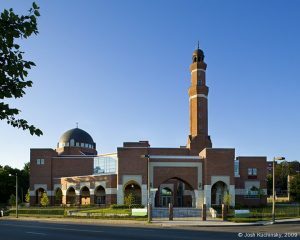 In America today (2018) there are over 3200 Islamic centers/mosques in all 50 states. Land ownership by the Muslim Brotherhood’s bank [the North American Islamic Trust (NAIT)], IRS records, and the jihadis leading these organizations, indicates at least 80% of these centers are a part of the Muslim Brotherhood’s jihadi network in America. Independent investigation also reveals over 80% of American mosques teach sharia adherence and violence to attendees, which is a logical outcome of them being MB jihadi mosques. According to our enemy, the mosque/Islamic Center is the place from which the jihadis here will launch the jihad when “Zero Hour” arrives. We can sit by and wait for that day, or we can begin dismantling this jihadi network in our Homeland. OPINION – I sent an alert to the FBI more than twenty years ago regarding acquiescence by the central government in France to the superimposition of a forty-member panel of Muslims vested with the authority to participate in the adjudication of any legal proceeding involving Islam, and the totality of things to which said term implies. Preview of coming attractions here? Probably. Not that it matters to me, but it was the only time I’ve ever received a response from said bureau. The female Special Agent who answered my letter in behalf of the government not only thanked me, but also acknowledged prior official unawareness of what I had said. The Parisian zones of exclusion all over the city today, into which even the police and fire brigades are hesitant to go, are no doubt attributable to the work of said panel. Infidels beware! Given, therefore, that by virtue of adherence to the Koranic concept of “sacred space”, Islam now lays claim to 475,000 square miles of U.S. land comprised of twenty-one hundred units encompassing 28 square miles each, it seems easy to see that no-go zones all across the country are clearly a part of our future. What do we do about Mosque that are already in place and meeting places that are not listed as Mosque,but clearly are for Islamic meetings. There are a few near me that from the outside look like abandoned buildings. The trash piles up, they look horrible, yet about once every 2 months or so the place is crawling with Muslims and women in their robes all inside of a fence located in a remote run down neighborhood. Another one makes its entrance behind a row of buildings in a strip center, out of sight from the road and without signs yet meetings are held here as well. The information in this article should be the topic of a sermon in every Christian church in America. It should be posted in every city hall, on every school bulletin board, and throughout corporate America in the shops and break rooms. We are under attack by Islam and most everyone would deny that. They think that the religion of peace is just that.. A peaceful religion. Further proof that our Federal government has been infiltrated and is now operating as an enemy of the State. There’s no other explanation for their Felonious actions. Being inaction, the failure to protect the borders and by extension it’s people. It’s not just failing to protect, it’s CONTRIBUTING to the destruction of its own people, society, culture, and form of Govt. The American people KNOW this, yet they refuse to act. It’s as if the entire Western civilization has lost the will to live. The ONLY thing that will save America is her own people. Until and unless they fight 👊 for their home, and yes that means dying if necessary then their children & grandchildren are headed for a truly horrific life. Just to narrow it down.TARGET PRACTICE AND PRACTICE AND PRACTICE. It’s super obvious why the are here.